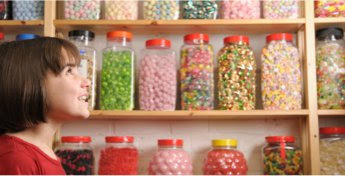 One of our favorite candy stores online is Old Time Candy . Old Time Candy provides fresh old fashion and retro candy. You choose from over 300 of your favorite candies from when you were a child. These folks have done a terrific job at researching the most popular old time candy by the decade. This is from over 70 manufactures of retro candy from the 1920's through the 1990's. We received a 4 lb. 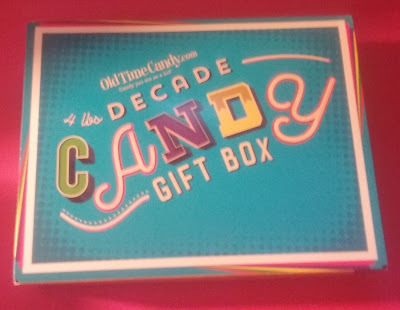 box of candy from Old Time Candy . I couldn't make up my mind so I decided to choose the "all decades". This is an assortment from the 50's, 60's 70's, 80's and 90's. My kids were so excited to see candy they have never seen before. 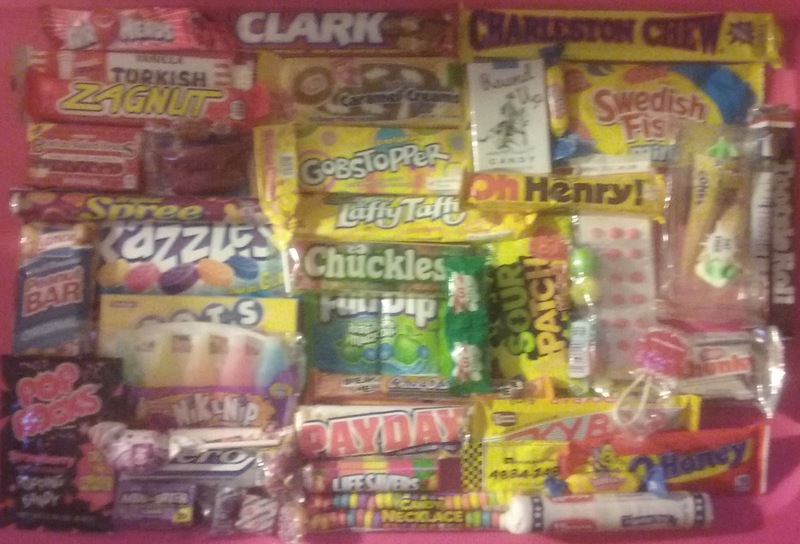 Some of the candy that came in our box was Root Beer Barrels, Pop Rocks, Smarties, Chick-O-Sticks, Blow Pops, Pay Day, Zero, Sixlets, Fireballs, Candy Buttons, Sky Bars, Caramel Creams, Laffy Taffy, Abba Zabba, Swedish Fish, Sugar Daddies and lots more! The candy came inside the cutest box. My kids got a kick out of the wax lips and small wax bottles with juice inside. We also had a little fun guessing the decade of some of the candy. The candy from Old Time Candy always arrives nicely packaged, fresh and tasting delicious! Whats great about Old Time Candy is if you come across a retro candy bar you haven't had in years, these nice folks will gladly ship you out one candy bar. Most candy companies I have come across you have to order a minimum amount. You can buy 2 pieces of candy up to 5 lbs and even more I'm sure. Karen and Donny Ray are the owners of Old Time Candy. Their business is located in LaGrange, Ohio. They grew up in the late fifties and early sixties, their certified baby boomers when going to the movies cost only 0.50. Their adventure in opening up their candy business began in 1999 when they walked into a candy store in Cleveland, Ohio that specializes in Old Time Candy. They had no idea that many of their old time favorite candy still existed. 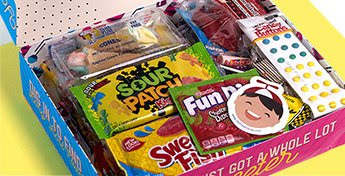 They went online in 2000 with their first assortment of candy and began to grow. Old Time Candy recognizes the dignity of life in their customers, employees and suppliers. They treat everyone who crosses their path with the highest standard of integrity and morality. Check out Old Time Candy! Right now Easter candy is on sale. This would be a great idea for a grandfather, grandmother, birthday parties anniversaries and more. This is an affordable way to enjoy classic candy. I recognize all the candies you mentioned. I especially loved candy buttons when I was a little girl. I would try to eat them off the paper row by row. Old Time Candy sounds like an excellent place to visit. What a great idea for those who miss certain candies that aren't always available in the stores. There are a couple that I have in mind. Curious if they have them. This is a lovely idea for a nostalgic gift, especially at Easter. What a lovely idea to have. WOW! I think my family would enjoy such candies. 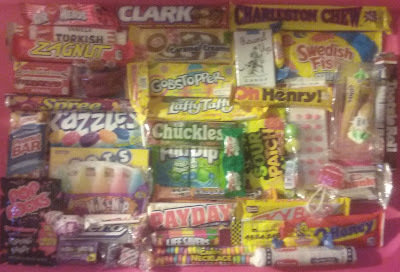 :) It's great that Old Time Candy gives an opportunity to find all the sweets from the past in one place! I remember a lot of these sweets from my childhood. I need to check out this website so I could live it. Oh wow, What a fun and cute idea. This would be the best gift box I've ever seen. My kids would love this for sure. I have ordered from this company! They have the absolute best selection anywhere!!!!! All those candies I thought I'd never find again are there. This would make a marvelous gift for anyone--or even just a thank you for yourself!!! Ahhh...What a way to take me back to my childhood. I do believe the "Easter Bunny" needs to hop on back to my house with a couple of these boxes. This is such a good idea! There are so many creative ideas for Easter that I need to try every year. Wow, I remember way back in my childhood we have those candy balls with different colors, I think we had it in candies and bubble gum as well. It's really a great gift for those retro lovers Happy Easter! Oh my gosh what a great idea! This would have been an awesome blast from the past with sugary treats! Such a nice gifts for the kids and our oldies. Great one to remember the difference of candies before and at present. This is such a nice idea. Oh wow! I love seeing all this older candy. What a blast from the past! Only know a few of these brands, definitely a good box to give to someone who grew up in another era.